Here at the Google Visualization HQ we focus hard on making the Visualization API the easiest and simplest platform for visualizing and reporting data on the web. We're always excited to see the community uptake and develop our product, making it even more useful and accessible to other developers. One such initiative is the PHP wrapper class that Thomas Schaefer wrote for the Visualization API. The class wraps the API and enables PHP application developers to quickly integrate visualizations into their code. Thomas even published reference applications that enable you to get started even quicker. We love your work Thomas, keep it up! 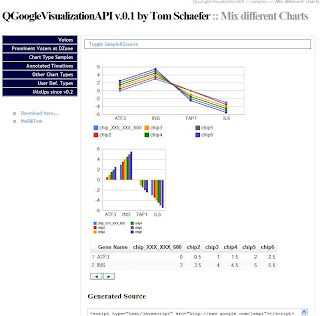 Yesterday the next version of QGoogleVisualizationApi was approved at www.phpclasses.org. It supports nearly all major features of Google's Vis. API. Dataview, DataQueries, Table Formatting are supported. You can easily implement custom functions etc.